Employee termination letter is an instrumental tool for the organization during termination of an employee due to various reasons like a layoff, poor performance of the employee, market fluctuations, contract termination or to take disciplinary action against the employee. They mention the reasons for termination and provide details of the final paycheck. They also remind the employee to hand over the company materials. One can search Google using Lease Termination Letters and find Sample Letters to terminate lease agreements. 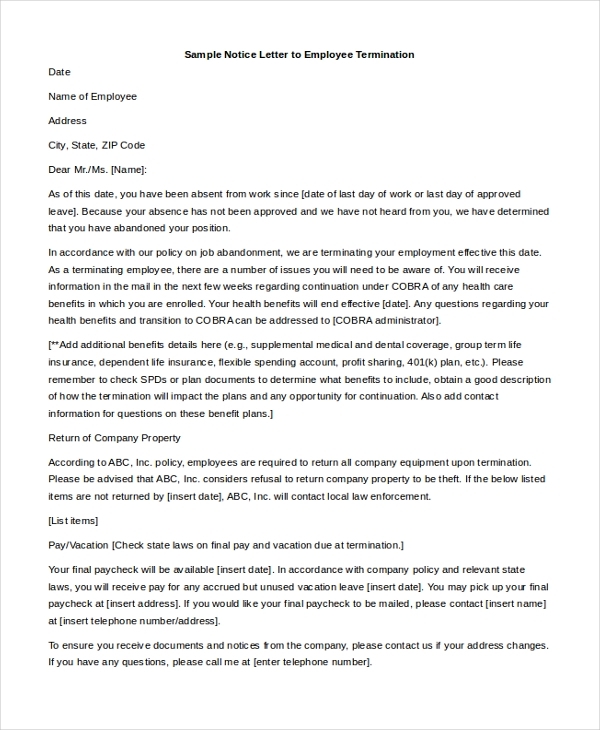 This employer termination letter to employee confirms employment termination and mentions the final paycheck details. It also confirms that the company had received company belongings like laptop and office keys from the employee. 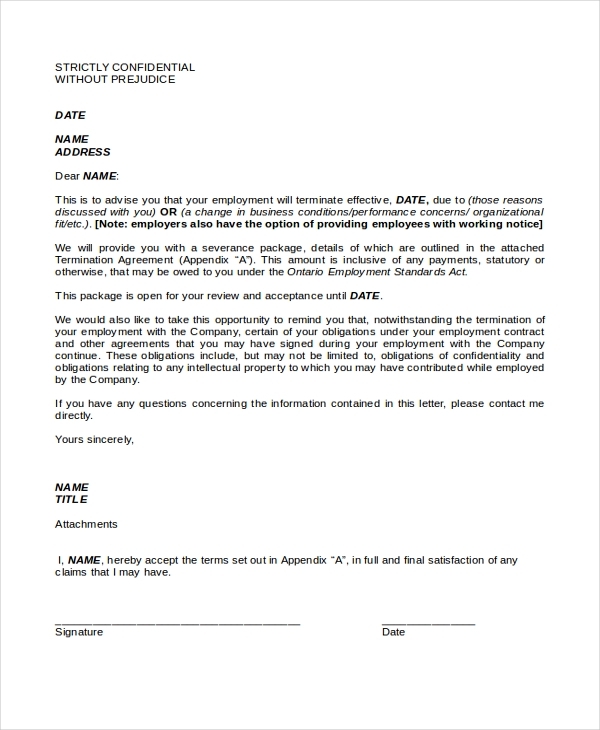 This employee contract termination letter announces contract termination. It mentions the date of termination and requests the employee to return company materials. It informs the employee to collect benefits and paycheck. You may also see Sample Resignation Letters. This termination letter sample presents the details of benefits that are provided to the employee on termination. It mentions the date of termination and requests the employee to contact the human resources department for any questions. 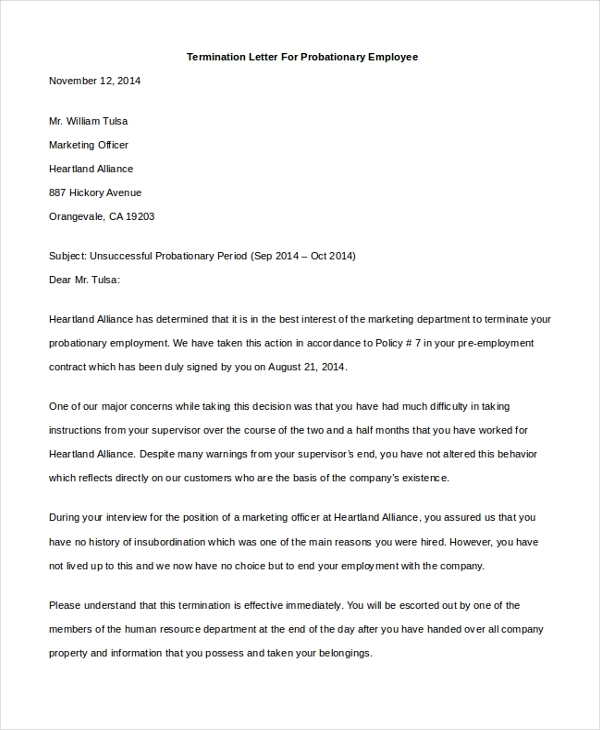 This employee termination letter confirms the employee termination due to poor performance. It describes the details of chances given to the employee to improve performance. It also mentions the final paycheck and benefits details. You can also see Letters of Resignation. 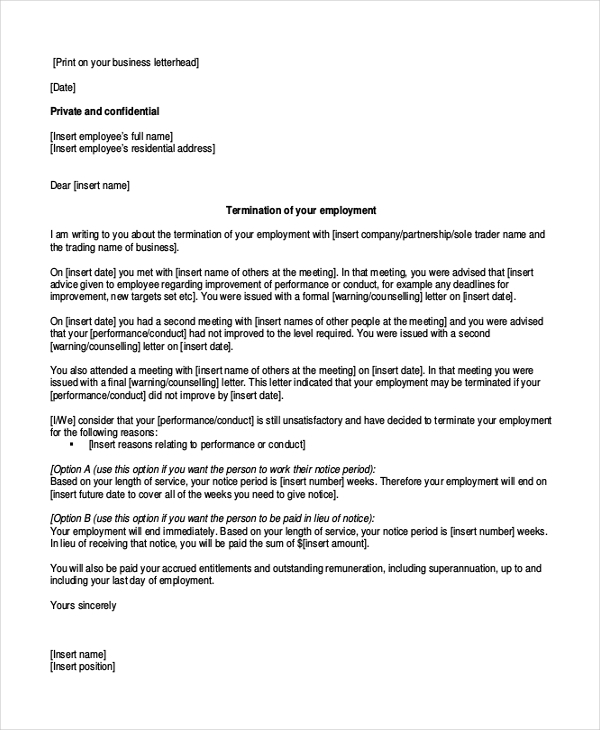 This termination letter mentions about employee absconding from duty and hence the employment has been terminated as a disciplinary measure. It also states that the employee has not provided notice to the company. The letter encloses the final settlement details. This termination letter for probationary employee mentions the reasons for employee termination. It says that the employee has failed in taking instructions from the supervisor. It requests the employee to hand over company belongings. You may also see Letter of Resignation Examples. 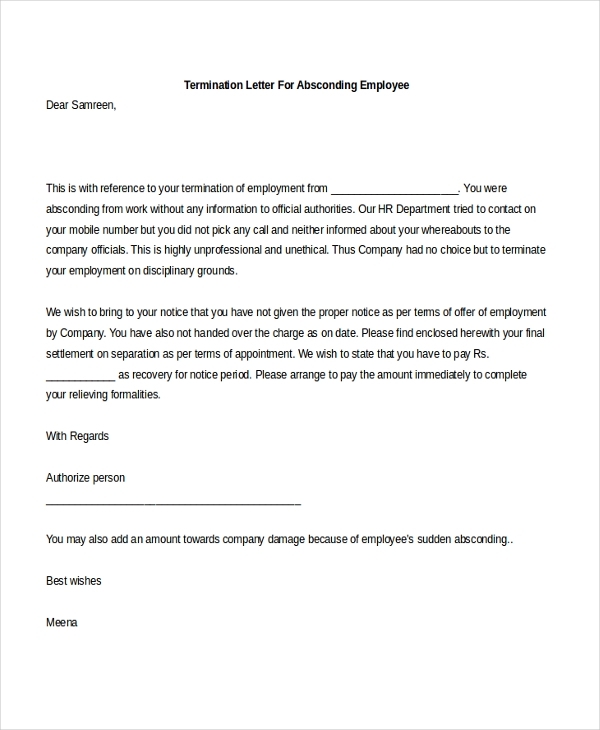 This sample employee termination letter presents the effective date of termination and the reasons for termination. It encloses the severance package details and requests to provide acceptance. It reminds the employee about obligations related to employment. This disciplinary procedures and termination of employment present the details of procedures that should be followed when terminating an employee and provides a sample termination of employment letter as well as a warning letter. You can also see Lease Termination Letters. What to Include in Employee Termination Letter? Employee termination letter should clearly state the reason for employment termination by citing the company policies and procedures. They should mention the date of termination and provide the details of previous warnings that are issued to the employee. They should also mention the chances given and training that is provided for the employee to improve the performance. In the case of termination due to layoff or downsizing, the letter should mention the reasons for appropriately. They should mention the company property that the employee is holding and informing him or her to return the same. You may also see Letter of Application Forms. What are The Benefits of Employee Termination Letter? 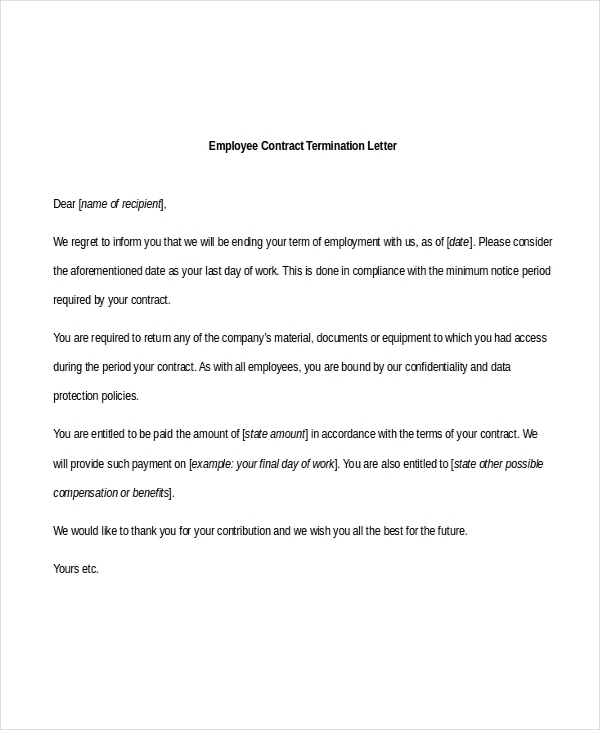 Employee termination letters are extensively used by organizations to terminate the employment. There are plenty of samples and templates available and one can download them easily. These sample letters are easily modifiable as well. These are an important document for any company which helps to legally record the employment termination.